I was going to put myself to bed the minute Brooke went to bed, as I have a massive headache, but decided that I was going to start putting together a palette for the wedding of Amanda and Trevor who are getting married next July. I met with Amanda today and I think for the most start we are starting a bit from square one, which is awesome as I have some great ideas for what they want. 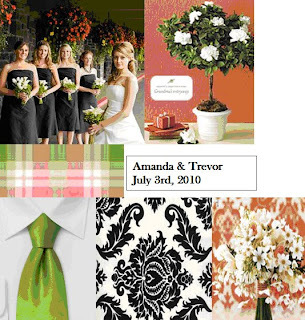 So far, they know black and white will be predominant in the scheme, and Amanda was pretty sure about adding coral to this, and I thought maybe an apple green accent as well would tie everything together. The look of Damask has made a major comeback the past few years, I even have a lululemon hoodie in Damask! Using this for a black and white wedding really breaks up the starkness of the two pigments and makes it a bit more elegant and romantic, no checkerboard wedding here. Because of it's popularity you can find pretty much anything in this Syrian originated fabric (you thought it was French didn't you? ), from candles, table runners, invitations and even toilet paper. Not sure if anyone works in specialty toilet paper into their budget! Amanda is from the East Coast of Canada and wanted to integrate this into the wedding. Most shells have coral colours in them, so this wouldn't be difficult at all, it was the tartan that might be a challenge, but I want to make sure sentimental components that clients wish to have are always used. They have purpose and meaning and it's always about the little details. I found a sample of green, white and coral tartan that could be used to tie around vases or around the bouquets. I was so happy that I found something that really blended well with everything else I had chosen for this palette. We have over a year to get this one together, so I am not sure as to why I felt I needed to do this tonight, I guess I knew I'd be awake all night worrying I would forget all of my Damask madness by morning.